Back in 2014, I jumped on a bandwagon of bloggers writing about their favourite meals of the year. I really enjoyed reading recommendations from other people, and in turn looking back at what I’d eaten, but I didn’t expect it to be quite such a popular post. Following several requests to do the same again this year, here are my five favourite German meals from 2017. We’ve only been back in the country since October, giving me a rather narrow window to choose from, but I have made a point of eating well since we returned home, so it turned out not to be too hard to pick my top five. And I’d eat them all again in a flash. In November, I spontaneously overnighted with Rachel of Arts in Munich on my first ever trip to the Bavarian state capital. Rachel, thoughtful and generous host that she is, had picked up some of Munich’s best Weisswürstchen from Gaststätte Grossmarkthalle, and we ate them for our Sunday breakfast with sweet mustard, fresh pretzels from her local bakery and a Weissbier alongside*. My first proper Bavarian breakfast, and a wonderful one indeed. After the first wine tasting of the local wine tour I joined in October, our small group made our way up into the vineyards to eat lunch with the winery owners and the last of the season’s grape-pickers. The food we shared with them – a simple spread including gulasch, Fleischwurst and Zwiebelkuchen – was good, but combined with the excellent wine, made with grapes grown right there on the slopes where we sat, the warm sunshine and the striking view across the green hills and valleys of the Nahe region, made for a truly, gloriously memorable lunch. On returning home, it was most pleasing to discover that a very good Frankfurt-style Apfelwein (apple wine) tavern had opened around the corner in our absence. The Schoppenhof is a warm, cosy pub with excellent traditional regional food and a very relaxed and welcoming atmosphere. On our first trip there, hankering after a piece of good meat, I ordered Frankfurter Rippchen: a thick slice of cured pork served with proper, earthy mashed potatoes and a healthy portion of Sauerkraut. I can’t wait to have it again. Perhaps it’s because this was our first meal at my mother-in-law’s after a year abroad, but I swear this Hackbraten (meatloaf) was the best Omi’s ever made. The ground meat was spiked with fresh thyme, and the meatloaf served with boiled potatoes and a simple salad of Romaine lettuce dressed with fig balsamic vinegar. Along with the nectar-like 2008 Huxelrebe Beerenauslese from Weingut Wetzler that my father-in-law had plucked from the cellar, this was one blissfully delicious dinner. Ten days before Christmas, I joined a group of friends at one of my favourite restaurants in Wiesbaden. Weihenstephaner on Taunusstrasse is a Bavarian-style beer hall that serves up solid traditional dishes from all over the country (and beers from Bavaria’s famous Weihenstephaner brewery, allegedly the oldest brewery in the world). Despite the very good menu, I find it hard to resist their Schweinshaxe (pork knuckle) when I visit: slow-cooked pork encased in crackling that’s salty and crunchy, with just a hint of almost caramelly chewiness that sticks to your molars in the best possible way, and served with two fat potato dumplings and a small heap of tangy fresh cabbage salad. 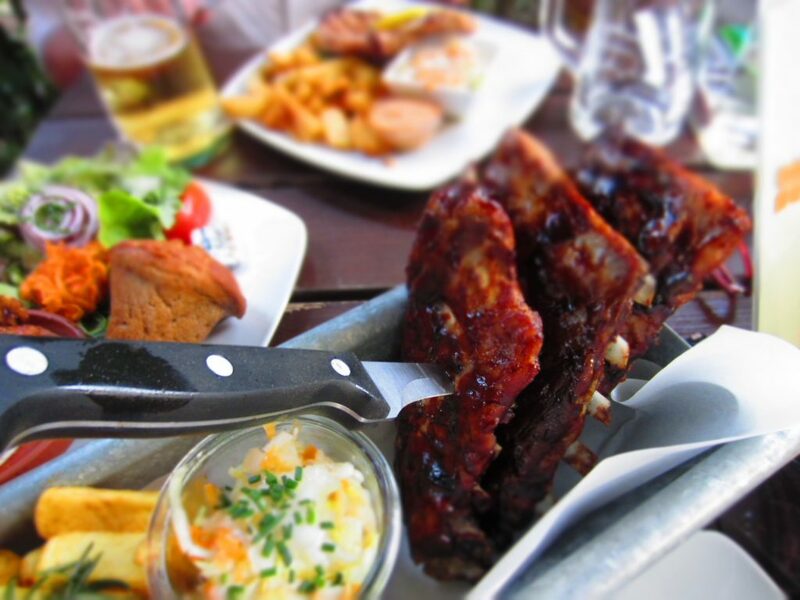 A set number of Schweinshaxe are cooked from scratch each day, so it’s worth ordering ahead if you really want one. This was not just my favourite meal since we returned to Germany, but probably in my top five of the year. Heaven. * In the interest of transparency: I couldn’t eat the pretzels, and my beer was a very good gluten-free one from Lammsbräu.